In a special series of profiles, Smoke Signals takes a look at women artisans working in the traditionally male world of the Western Lifestyle. Have an idea for a new series of stories? We want to hear from you. Send your ideas to us at smokesignals@highnoon.com. Several times throughout the year, when Smoke Signals pops up on your screen, you may be immediately captivated by the visually rich photograph that greets your eye. This photograph immediately transports you from whatever you're doing into the romantic world of the beautiful American West. It's also very likely that Nadine Levin is the eye behind the lens that created the image before you. (As a matter of fact, check out her photo Heading Home in the February 2013 Featured Photography section of this website). For Nadine, life, and her photography, is about "savoring the ordinary, not just the extraordinary." What she captures with her lens, however, transforms the ordinary into the extraordinary. "I've been taking pictures since I was a young girl. I always loved cameras and taking photos." It wasn't until after the birth of her first son some 28 years ago that Nadine began really learning the craft. "I was taking so many pictures and we were traveling so extensively around the world with my husband at the time, that I finally decided to take photography classes and learn everything I could about lighting and even developing my own photos. People would suggest to me that I should become a professional photographer, but at the time my two sons were my entire focus. My life was entirely devoted to raising my boys and taking a lot of pictures along the way." Nadine, while East Coast born and raised, has always been a cowgirl at heart. Her passion for the West runs deep. "I grew up riding English (the hunter/jumper thing) but I didn't play with Barbie dolls, I was watching Bonanza. My Mom found an old picture of me dressed up like a cowgirl when I was very little - I guess I was born to it." Nadine, and her current husband Alan (a man who is unquestionably a cowboy at heart) live the Western lifestyle just outside of Washington D.C. in Maryland. 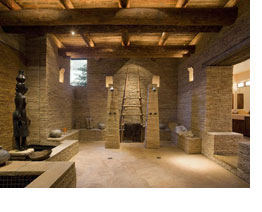 Their home and ranch is designed, both inside and out, to rival the finest in Jackson Hole. They've brought the richness of the West to the East, complete with a Western barn filled with horses wearing Western saddles. Yes, passion for the West runs deep for both she and her husband. That passion has also led them to be very involved as sponsors of the TCAA show at the National Cowboy and Western Heritage Museum in Oklahoma City. "Being involved with these organizations has enriched our lives to such a great extent." It's not often that passion becomes profession, but for Nadine she feels so lucky it has turned out that way. With both her sons, Mac and Josh, now grown and on their own, her life is entirely about capturing a time and place in history that will never again be repeated. This is how she views photography - they are virtual snapshots of a time and place that will never occur again. While Western photography is where the fire in her soul really lies, her world travels are evidenced in her expansive portfolio of life and nature around the globe. All of her photos evoke emotion, whether it makes you smile or inspires a story, they captivate your imagination. "All of my photography is real and completely natural. You see what I saw through the lens at that moment. There is so much trick photography out there but my work is completely organic." Nadine is also passionate about "savoring the ordinary, not just the extraordinary." "This was really a result of surviving an illness very few people survive. I can't explain it but after that experience, I began noticing things, simple things and their beauty, that I never noticed before. That experience also enriched my life in an unexpected way and it's a fundamental part of what I hope my photographs convey." Nadine did comment though, that a few times her photography has allowed her to photograph the truly extraordinary. "I shot a Space Shuttle launch once. Now, that was extraordinary," she recalls. High Noon is honored that Nadine Levin and her photography is part of our family and of Smoke Signals. Her work transports us from our computer screens to a place we would all rather be. Rich and evocative - that's what her work is about. For Nadine, she loves her profession now but what she loves even more is when people "get" what her photos are about. "It is so validating for me when someone looks at one of my photographs and exclaims, 'WOW!' That's the best part for me." One of the fun things about creating these stories for Smoke Signals is we get to take a glimpse into that person "inside the booth" at the High Noon Shows. And this time, the glimpse really revealed a most unexpected person - world traveler, world-class photographer and scuba diver who has dipped her toe into some very dangerous and exhilarating waters.... more on that later. What we do know about Andrea Esty is that she exclusively collects and sells Native American antiques and art - and she does it very well. While she admits she hasn't been selling and trading for too many years, her collecting and passion goes back to her early childhood growing up in northern Minnesota. "We lived near a very large Chippewa reservation and Mom would take me to pow wows and other events and I came to love everything about Native Americans very early on." At about the age of 10, Andrea and her family moved to Colorado where her love and knowledge of Native Americans expanded to the western tribes. "For me, my favorite is the Northwestern Indian material. Visually, I find their design elements stunning but I also am very partial to the works of the Northeastern tribes." In fact, Andrea's collection extends well beyond the Americas, extending to works from indigenous peoples from around the world, just a few fruits from her global travels. "My collection became so large that I had to begin selling it. And, of course, I vowed not to buy anymore but sometimes I still can't help myself," she says with her infectious laugh. "I began seriously amassing my collection in the 1970s and now, I'm selling it to pursue my real dream of scuba diving and videography." And the real Andrea story begins to unfold. As usual, the question is posed, "Did you have a another life outside collecting?" "Well yes, I did," she replies. "I was a race car photographer - that paid the bills for my collecting habits." Race car photographer indeed! Her commercial photography has been featured in the likes of Motor Trend, Road & Track, People Magazine and National Geographic to name just a few. She's a world class photographer with a bit of an A-list clientele. Eeking this info out of her was a bit like prying up old wood but eventually she came clean with some great stories. "Well, I was the official photographer for the Pike's Peak Hill Climb for a number of years and was the personal photographer for some off-road, stadium and NASCAR drivers." "Oh really? Like who," I naively asked. "Oh, let me think...Parnelli Jones, Al Unser, Jr., Al Unser, Sr., Ivan Stewart, Darrell Waltrip..." NO KIDDING! Now she was off and running with great stories of her life with the biggest and best of the racers. "I remember once I was doing a job for Chevrolet and they sent me to Al Unser Jr's house in Albuquerque. It was Halloween and he, his entire family, and staff were throwing a huge party on the front lawn - complete with tents - it was amazing. When I got there, I just jumped in and started to help decorate and then the party started and then live entertainment showed up. It was the Guess Who! I'll never forget that - it was so much fun. Al didn't tell me the Guess Who was coming to play at his Halloween party, he wanted me to be surprised and boy I was." Throughout the interview, Andrea was fighting the flu so, in deference to her ailing condition, I moved on but really wanted to hear more of these stories! As the publishing business began to change in the 1990s with its move to digital, Andrea moved on as well. "I just didn't want to work in the digital world. I love the print aspect, the magazines, the feel. Now I have gotten into videography and really love that." And there you have it. Her collection is rich and diverse and, as she puts it, her ticket to her next life of full-time diving and videography. A look at her website immediately reveals her quality and taste for what she collects and sells. 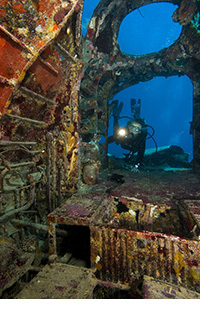 On one of her many dives, Andrea Esty explores the cockpit of the Betty Bomber at Japanese zero. "I'm not a cowgirl," she begins. "I'm a city girl, born and raised in Chicago." Well, that may be, but as the story unfolds, it turns out she's been a cowgirl all her life, she just didn't know it. And no, being engaged to a cowboy isn't the reason she's turned out to be a cowgirl. That doesn't count. She did this all on her own. "Well, I've always loved riding horses and my bedroom as a girl was always decorated with Indian art and dream catchers and I always loved cowboys and Indians. I just never imagined I would end up living the lifestyle - I'm a city girl!" What she did imagine and envision for herself was the life of a creative writer. Melissa's been writing since she was a little girl. By the 2nd grade, she was writing prose and poetry and entering competitions. Flashing forward, she went on to earn her MFA in creative writing and had already published several short fiction stories. Living at this time in Boston, working at a great job, she and some girlfriends decided to take a much-needed trip to Santa Fe, a place she always wanted to visit. It was while on this vacation, lounging at the Hilton Resort, that she got the call saying she'd been laid off. Another victim of the post 911 economy. "It was surreal - I felt like either Thelma or Louise - maybe both." Vacation over, Melissa returned to Boston but Santa Fe had gotten into her soul. She loved it there. So, she sold what she could and packed up the rest and headed to Santa Fe. No real plan, no real idea of what she would do there but she was on her way. Her life would blossom in Santa Fe, but she didn't know how much. With a limited budget but needing a place to live, she rented a mud and straw kiva way off the grid. It did have electricity but no running water. She had a well and an outdoor camp shower and made do for about 5 months. Needing a job to supplement her writing income, she went to work as an administrative assistant at Sherwoods Indian Art Gallery in Santa Fe. This is where her life would completely change. She became captivated with Indian art, the culture and the history. She immersed herself in learning everything she could about it. "I'd go to all the museums, all the galleries, I just loved it." 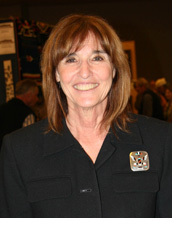 Her gallery job ultimately provided her with an introduction to Brian Lebel, who would come to Santa Fe each August. The first year he came, he chatted with Melissa and left her his card. She didn't call him. The second year he visited, he "chatted me up again and left me his card." "I'm not calling this guy!" she recalls saying. But there was something about him that got her attention. It happened again the third year he came to the gallery - nope, still not calling him. The fourth year she was done. She decided she was ready to make her move. She got "dolled up" for work everyday and, thank goodness for small favors, he came on August 6th. Yes, that was the day that Brian Lebel would finally get that date with Melissa. It took 4 years, but he actually asked her out for the next evening which just happened to be her birthday. The date lasted 6 hours and they've been inseparable ever since. But enough about Brian, we all know him. This is about Melissa. Melissa has brought her infectious energy, insight, unstoppable smarts and accomplished writing skills to Denver Old West. Her commitment to making Denver stand up and take notice is relentless. Whether it's television, radio or print media, she leaves no stone unturned. She has the highest standards and expectation and accepts nothing less for herself or the show and auction. Oh, she also does screen writing now in her spare time when she's able to steal away some quiet thinking space at her condo in Santa Fe - the place where her inspiration lies and her life unfolded. Santa Fe is said to have magic - well, it is magic for her. As for Brian and Melissa's wedding plans? No date is set and "we won't be pressured!" she remarks. Well, that may be, but she hints that she just may have the most drop-dead gorgeous dress in her closet just waiting for the day they say "I do." Yes, it has finally happened. Western couture has finally turned the heads of fashion editors at the top of their game. Indeed, it was the fashion editors of Vogue, Elle, Travel + Leisure, Vanity Fair and many more, who were on the judging panel at Dressed to Kilt in New York in April. Selected to be on the runway for the first time in New York was Western fashion designer Celeste Sotola of Montana Dreamwear. And it was her stunning Western inspired creations that had New York on its feet. Yes, the West was won that evening as her work and designs won Best Country Chic Designer in the country. Dressed to Kilt is an annual New York event hosted by a committee headed by no less than Sir Sean Connery. It's the second largest fashion event in the world surpassed only by Victoria's Secret. All the major fashionistas come out to see the most cutting edge designs from independent designers. From all of us at High Noon, we want to congratulate Ms. Sotola. She's a champion of the Western lifestyle and culture and New York just loved it. but most of you just know my work. I'm the one moving the mouse and clicking the keyboard to create the postcards, flyers, banners, ads, websites and auction catalogs for High Noon Show & Auction and Brian Lebel's Show & Auction. I'm also the art director for The Cowboy Way and Ranch & Reata magazines, and run my own graphic design firm, Ireland Graphic Design. One of the best things to come out of working with the folks at High Noon, Old West, and the magazines is that I get to meet and learn about all of the amazing artisans and craftsmen that are out there creating stunning works of functional art. The first time I walked through the show and saw the silver and stone jewelry and conchos, hand-made furniture and tooled leather saddles and boots I stood in awe of the skill and creativity that went into each piece. About a year and a half ago, I was presented with the opportunity to help promote these artisans and preserve the skills they possess through a new non-profit organization, DesignAmerica Foundation. As an organization, we hope to help expand the markets available to these artisans through a series of shows (beginning with DesignAmerica-Texas), speaker's bureaus and a nationwide marketing campaign. We are forming strategic partnerships with museums and corporations that also recognize the need for the preservation and promotion of America's individual artisans and craftsmen. In addition to supporting the artisans, DesignAmerica wants to help protect the skills these craftsmen possess. With the hardships resulting from today's economic climate, many artisans have been forced to put aside their craft and find "regular" jobs in order to support their families. If they are able to continue creating their art, they are unable to afford the helpers or apprentices that will carry the skills forward into the next generation. As DesignAmerica Foundation grows, we plan on making grants available to help the artisans afford to work as mentors or with an apprentice. We also plan on a series of short, downloadable, how-to videos for teachers, scout leaders and community groups designed to teach basic skills and maybe spark an interest in the next generation of glass blowers or leather crafters. Achieving DesignAmerica Foundation's goals is only possible with your help. For information about attending or become a sponsor or advertiser at DesignAmerica-Texas, visit www.designamerica-tx.com. To learn more or to donate to the foundation, visit the DesignAmerica Foundation website. In Smoke Signals' first attempt to interview this silver diva she had the flu - "just too sick to talk." Little did she know we would hunt her down in Mesa at the January show - there would be no escaping us now. She saw me coming... "but I'm just not that interesting," was Rochelle's attempt to dodge the Smoke Signals bullet. No, that doesn't work with us. She's part of our High Noon family and she was going to submit. Turns out, Rochelle had quite a bit to share. Perhaps her most quotable statement was about everyone in the antiques business overall. "In this business, you can be as weird as you want." Well said, Rochelle! Like so many of us who end up in this world, she came from a completely unrelated background. A social worker for years living in Northern California, working with disabled adults, she began to burn out. A good friend who owned an antique gallery in New York suggested she come to New York one summer and give antiquing a go. Well, that was the end of social working and the beginning of her new found love and career. And now she could be as weird as she wanted to be. She became captivated by the beauty of fine early Mexican silver from artists and designers such as Antonio Pineda and Salvador. With her new-found love, she returned to the San Francisco Bay Area and began selling these works to antique galleries throughout the region. She was spotted by the owner of one large collective who wanted her in his store. So determined was he to have her that he even got the showcases and put her front and center at the entrance. Indeed he was right. His customers loved Rochelle and her silver, and there would be no turning back. She became a full-fledged antiques dealer. Her passion and collecting expanded beyond Mexican silver to buying and selling silver collectibles, match safes, hat pins and other fine "oddities." Cork screws and wine related collectibles became another niche for Rochelle as did elegant Art Nouveau period pieces, mid-century Modern, and Black Forest pieces. You should see some of her Black Forest nutcrackers - too cool to believe. Over the past 30 years, Rochelle has done shows coast to coast, taking her beautiful pieces with her to share with the world. But she also takes something else, her elegance, grace and little naughty smile with her that is completely infectious. Her partner in crime? Her husband Michael, an engineer by profession who is by her side at every show...The perfect team for this weird business! The Spectular Golden West Cowgirls! 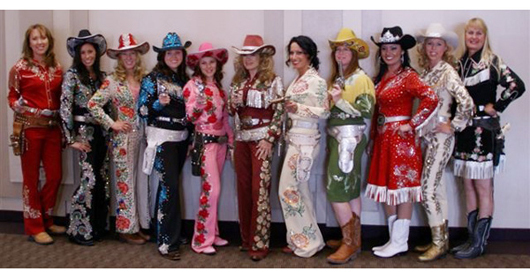 The Spectacular Golden West Cowgirls! So, who are those beauties be-decked and be-jeweled in vintage Manuel and Nudies strolling through the High Noon Show, turning heads and breaking hearts? They are the amazing women called the Golden West Cowgirls and their champion and leader, Bruce Peterson. They are much more than a beautiful visual representation of the fabulous West. Each of these amazing women are master riders, and from competitions to parades, they can do it all. Since 1987 when founder and director Bruce Peterson first started to assemble his "dream team of cowgirl ambassadors" they have been seen in the Rose Parade and rodeos. But more importantly, everything they do, they do to benefit the Roy Rogers and Dale Evans Happy Trails Children's Foundation. (www.happytrails.org) For over 30 years, the Happy Trails Children's Foundation has provided a safe haven for children at risk carrying on Roy Rogers' and Dale Evans' belief that "together, all of us can make a difference for our beloved nation's greatest treasure: its children." The Golden West Cowgirls are committed to ensuring this goal is achieved. Through their public appearances, whether in competition or parades, all of their proceeds are donated to Happy Trails. These women may be stunning in their regalia but are even more so in their hearts. They are passionate about their goals, consummate professionals in their own right , who work together as a team driven by their love of what they do and what they represent. It's about family too. Mothers and daughters are involved together, passing their legacy and experiences to younger generations. So, next time you see them passing by on horse back in a parade or showing off their master horsemanship in a rodeo, take a second look at this team of beauties be-jeweled and be-decked. Their hearts and their souls are all about helping children and making their world a safer and happier place. When Share Cameron walks into a room, you know she has arrived. Her elegance, grace and passion for who she is and what she does, fills the room with energy. Always dressed to the nines in classic rich, Santa Fe style, she not only walks the walk but she talks the talk about her mission in life - to promote and support the incredible art and design being created by Native Americans. Not necessarily a dream you would expect from a girl born and raised in Toronto, yet her life unfolded in a journey that would lead her into discovering the riches of the American Indian culture and designs. It was the Northridge Earthquake in Los Angeles that would change her life. Landing in L A for a number of years where she obtained her degree in massage therapy and had a thriving practice in Shiatsu and Reiki, the 1994 big rumbler found her body injured and her possessions mostly broken. That was it. She packed up what she had left and moved to Santa Fe. Needing a job, she began working at Packard's on the Plaza where she began to study and learn the depth and beauty of what the Native American artists were creating. She met and was embraced by the finest jewelers, kachina carvers, and weavers and their passion traveled deep into her soul. And then, like kismet, the man who would become her life partner and husband walked through the door. Yes, it was world famous Native American silversmith Gibson Nez who would steal her heart and take her on a journey, crisscrossing the country doing exhibitions and shows, from New York to Las Vegas. She was always at his side and became his biggest advocate. But something else was happening along the way. Share was developing the deepest understanding of who these people were and the art they created. She was also able to see first hand, that Native Americans are continually challenged in the areas of self-promotion and cultural assimilation. As her life journey continued, Gibson passed away and Share found herself needing space to recover and regroup her life. She returned back to Los Angeles with the goal of returning to her previous life of healing, her massage therapy career. In a very short time however, she realized something was missing and felt like a fish out of water. She missed Santa Fe and the inspiration of rich art culture. Sometimes though, you have to leave to discover what it is you truly want. It's been her recent time in Los Angeles where she has re-discovered what her true passion is - promoting and supporting the finest Native American artists and designers, taking them to markets and worlds they might not get to on their own. She wants the world to see, know and appreciate the beauty of their work as truly world class. And, to this end, Share knows Santa Fe is her true home and she will be returning there in spring. High Noon is extremely honored to support Share Cameron's mission to do just this. Educating people and exposing them to this amazing work is what will ensure that the richness of the Native American cultures will continue to be woven into everyone's lives and thrive for centuries to come. Share has created an online portal to do just this. Share, The Inner Sanctuary is where you will find the resources for, and work of the best American Indian artists. But Share is more than just a website. She's out there, face-to-face, at shows, museum exhibitions and more, promoting these amazing people. Again, like Kismet, while in Los Angeles, Share connected with and has become an integral team member of the DesignAmerica Foundation, an organization committed solely to the promotion of America's truly independent artists and designers. 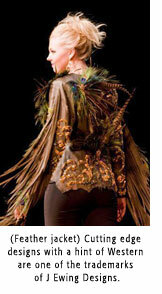 Share Cameron - one dedicated diva determined to take Native American design to the top of the charts. Los Angeles is not necessarily the place where a woman whose passion runs to all things exquisite and western, will find the compadres she yearns for to fuel her love of the Western Lifestyle and all that it encompasses. But make no mistake, there's a reason her company is named Maverick Style - she's a renegade who has ignored the glitz and glamour of her hometown LA and has become the ambassador of the sophistication, elegance and romance of Western Style. Meet Christin for lunch at any of Los Angeles' chic eateries and she's the stand-out. Always impeccably dressed in the finest western-inspired clothes and jewelry, from boots to handbag, she walks the walk and talks the talk - but it's from the heart. Somehow, Jackson Hole (WY) always seems to play a role when inspiring and then converting us urbanites to the richness of the West. Family vacations there as a child left their indelible mark on this LA Diva. "I just loved the mountains and horseback riding and I never forgot how beautiful it was. I still have the little cowboy hat and western belt I got there when I was just 11 years old. Well, they don't fit anymore," she laughs, "but I still have them." Christin's life and career back in Los Angeles took her away from her real love. But her years in retail, a successful career with the Walt Disney Company, then as Vice President of Domestic Licensing at Paramount Pictures, all contributed to the success she has realized today. Her extensive knowledge of marketing, branding and promotions plus her keen eye for the finest designs is the foundation upon which she has built Maverick Design and Marketing. Even though she lived the "corporate" lifestyle for years, her husband was an avid Western aficionado. Her honeymoon took her back to Jackson Hole where she re-discovered how much a part of her soul Western lifestyle was. It was on a subsequent trip to Dallas that she was exposed to the high-end couture and designs of Western fashion. "I had never seen anything like this before. I realized Western wasn't just boots but there was this spectacular high-end side of western fashion." She started collecting Native American jewelry and the clothes to go with it. Now back in LA, she was restless and knew it was time to make a change. She was driven to focus her energies and professional life on the world she loved. "I woke up in the middle of the night on my 50th birthday with an epiphany!" she laughs. "I would launch my new company, Maverick Style Western Design and Marketing, and embrace myself into the western world. That was an evening in July and by November, the company was up and running and she was at Cowboy Christmas moving and shaking, marketing and promoting. Today, Christin and her company are unstoppable in promoting the finest in western design and lifestyle. From the trendiest accessories, upscale clothing, sophisticated home décor, Western art and artists and the music that makes it all so infectious, she's your one-stop shopping if you're looking to promote your creations. She penetrates the country, traveling coast to coast, always looking for new artists that need to be exposed to the world. From creating marketing strategies, promotional materials, social media, blogs and email marketing to complete special event planning, she will catapult your work to the world. And, when you get the call that one of the "big guys" want to talk to you about carrying your line, well, she's the woman for that too. Her years as VP of Domestic Licensing at Paramount Pictures makes her just a bit of an expert in this area as well. Christin Miller, she Brands the West and we are so honored to welcome her into our High Noon family of cowgirls and cowboys! 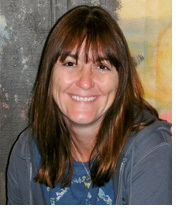 This month, High Noon chats with Peg Schaffer. She has "one high heel in the corporate world and one boot heel in the cowboy world." On a recent flight, Peg was chatting with the person sitting next to her who inquired "So, what do you do?" Her response? "I manage 15,000 cowboys." And manage she does through her tenacity, her passion and her git 'er done attitude! So how does a woman born and bred in Texas, with the papers to prove it, with a professional career that had her in the throws of international business, manage to "manage" those 15,000 cowboys? Perhaps it goes back to her first job right out of college when she was hired as the first female sales rep for Playtex International. There she was, green out of college, sitting in a corporate sales meeting in Chicago surrounded by "men, scotch and cigars" and she, the only woman in a bevy brassiere. Undaunted, she went on to be top of her game, parlaying this role into top level marketing and sales roles with Porsche Carrera and Laurel Burch to name just two. Managing $30 million dollars in sales and flying around the world is how she ultimately stumbled into the world of Western collecting. "There would be times when sales meetings or appointments didn't come together, so I would kill time popping into antique shops." This is how it all began. She started collecting smaller antiques then became a bit captivated by Western antiques, perhaps an outgrowth of her Texas roots. Eventually moving back to Texas, Peg became involved with the Texas Centennial celebration and the deal was sealed. She was in deep and going to get in even deeper. Juggling her full time non-stop corporate job, she began selling her Western antiques at shows. She does recall, early on in the game, that it was a bit like that corporate sales meeting in Chicago - she was one of the few women in the business and it took a while to be accepted. It all happened because of the computer she would schlep with her. John Villines, then President of the NBSSCA, noticed her early techno-affinity at a show and asked her "you know how to use that thing?" "Sure do," she replied. "I bet you could manage our membership list on that thing," he countered. "Yes, I probably could." 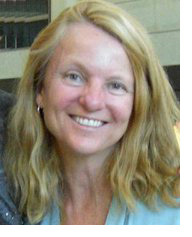 Well, that was how it started and now, for 10 years, Peg has not only managed the NBSSCA membership list, but managed the financials, written and edited the newsletter, but more importantly, been the driving force behind marketing the artists and artisans at the core of the NBSSCA. This is where her unstoppable passion really lies. "This is the best job I've ever had that I didn't get paid for." Peggy talks at length about promoting these amazing artisans and sustaining and growing the culture and the collectors that will ensure their craft continues to thrive. Peg's passion also goes to nurturing young collectors and encouraging young artists to pursue their goals in master craftsmanship. "I do absolutely everything I can to promote and support each and every member and potential member of our association. As artists, these talented individuals are often not the best at promoting themselves. I tell them, 'your Momma taught you not to talk about yourself and it stuck so I'm going to do it for you." And do it she does. From sales techniques to marketing ideas to PR, she's there for each and every one of her 15,000 cowboys. 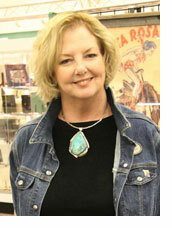 Peg knows how lucky she is to be part of this wonderful world of Western collecting and creating. "It's a culture and a family unlike any other and I'm so grateful to be part of it." Family? Hubby? Indeed. She just refers to him as her James Bond. He tolerates her western world but also has the collecting "bug". She's working hard to influence her daughter and three grandchildren to embrace the western heritage. Now retired from the world of corporate sales and marketing, she's busier than ever representing seven high-end antique galleries in Texas, working tirelessly for the NBSSCA and, oh yes, she has a full-on other company of her own, Lucky Star Ranch with its line of old West rodeo art and graphics with a line of clothing in the works. Whew - it's tiring just thinking about it. Go Peg! It's your energy and enthusiasm that is an inspiration to us all. Globe Trekker and Goddess of the Finest Native American Jewelry and Crafts. Sitting with Barbara and her husband and partner, John Selmer, at their store in South Pasadena (CA) befittingly named Santa Fe Crafts, you are surrounded with the most dazzling and rich representations of the finest jewelry, basketry, kachina dolls and textiles to be found - Hopi, Navajo, Zuni and Pueblo to name just a few. A perfectly placed round table with chairs in the center of their store, which they opened just a year ago, has quickly become the destination to spend delightful hours with this engaging, bright and elegant couple, learning about these Native American creations - the finest you'll find anywhere in the world. Learning from the masters, both Barbara and John have earned the reputation as nationally renowned collectors, appraisers and authorities. Sit at the "table" long enough to place your purse down and the offer of "water?," "glass of wine? ", "champagne?" comes from Barbara, John or sometimes from both at the same time...they're a great team and a pure delight. But back to Barbara, our inner cowgirl and her life journey to this point - and what a journey it's been. Barbara tells the story with a twinkle and smile that just says, "I've had a ball" but also says, "there's more I'm not telling you..."
A perfect example of this is how it all began. She starts the story from the early 1970s when she was living in San Francisco and designing a clothing line using exquisite textiles from Guatemala - a line of fashions picked up by both Macy's and the-not-too-shabby department store I. Magnin. 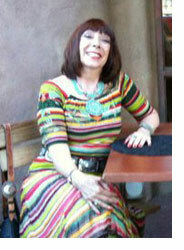 "I would spend four months a year in Guatemala, selecting fabrics and textiles for my line of designs. I was able to do this very successfully for years until the revolution made it too dangerous to travel there any longer." So, how does a young woman, born and raised in San Francisco, end up traveling to Guatemala to select textiles and fabrics instead of using the very vibrant fashion districts in San Francisco? When posed this question, Barbara said nothing but the look and twinkle in her eyes said it all. Her husband John jumped in to say, "it had to do with that hippy era, didn't it, honey?" She said nothing. Silence at the round table. Then John boomed, "It was a guy! There had to be a guy involved!" Well, yes indeed, Barbara admitted, "love, or young lust" had her traipsing back and forth from North America to South America "buying textiles." Well, perhaps the revolution put the nail in that coffin too, but more details were not revealed - John didn't want to know...and Barbara wasn't telling. Now back in San Francisco, Barbara had always wanted to see the Southwest so off on the train she went, first to Flagstaff then on to Zuni looking for Lena Boone, renowned fetish maker. Barbara was overwhelmed by the "power" of the area and the culture, and yes, she bought an amber fetish and was hooked! She traveled back and forth from San Francisco to Santa Fe until karma intervened with an offer to move to Santa Fe to administrate an educational grant just bestowed to the Save The Children Foundation - the project would be named Santa Fe Crafts. So there it was, 1984, and Barbara was living in a trailer outside Santa Fe. Among the many incredible experiences she had there was the chance to meet and have tea with Fred and Alice Kabotie - an event she still remembers. The Santa Fe Crafts project found Barbara involved with museums across the country, among them, the Southwest Museum in Los Angeles where she met fellow Native American passionado John Selmer. John had been collecting Indian art since he was a child - the match was destiny and they were married in 1991. Together they became an unstoppable and amazing team. Since 1991, together, they have traveled the globe, built collections world wide including the famous Kashiwagi Collection now housed in a Japanese museum. They were also integrally involved in the early days of the now major retailer Coldwater Creek, supplying handmade American Indian jewelry, when Coldwater Creek still was all about "Made in America." They've been sent as emissaries to Canada and beyond for the US Government on trade missions. On one trip to Canada, they ended up in remote Alert Bay where they commissioned an Indian artist to create a totem pole for Discovery Channel's new flagship store in Washington D.C. The store is gone now but the pole resides prominently in the White House. So back to the round table in their shop in South Pasadena. The stories could have gone on for hours, several bottles of champagne could have been drunk - some lives just lend themselves to that, and the life of Barbara Goldeen and her husband John Selmer are two of those. There's something special about those who have embraced the Western and Native American lifestyles. It's a passion that runs deep for the art, the pottery, the textiles, the leatherwork, the furnishings - the history and the richness. The passion for collecting runs deep as well. Some have small collections while others amass enormous collections running the gamut from world-class saddles to art that could fill a museum. What to do with these collections so they become part of your life and lifestyle instead of taking up space in boxes in the garage or worse yet, locked away in storage where they can't be enjoyed? This month, Smoke Signals is very honored to prescribe the ultimate remedy for this problem. She's as passionate about your collections as you are, yet has the amazing ability to take your treasures and incorporate them, in the most elegant manner, into your home and lifestyle. She's Kris Lajeskie - Kris Lajeskie Design. Interior designer extraordinaire - absolutely, but she's much more. Sometimes a picture is worth a thousand words, and a look at some of the rooms and environments she has created reveals her rich and dynamic approach to showcasing art and artifacts. Kris understands that creating a collection is a very personal and serious endeavor. To that end, she sees her role as that of curator, showcasing pieces while paying attention to every detail from lighting down to the perfect nail head. According to Kris, the biggest challenge when working with these important collections is to ensure that they do not lose their impact and individual beauty when they enter the home. So often, collections become displayed in a way that does not do them justice. "I consider myself a purist," says Kris. It's of utmost importance to her to retain the purity of a collection - focus, presentation and balance, and yes, the ever-present air of understated elegance. While Kris has worked on projects around the world, from the finest hotels to penthouses in New York, her genuine love for her clients and respect for their collections rings through in every project. "I have a ball with my clients! I don't ever want to interrupt their passion for collecting." Kris designs homes and environments to her client's tastes - not her own. She approaches each project as a collaborate effort. She grows with her clients as their collections continue to grow, tweaking, adjusting, or completely re-doing. "Working with collectors is an ongoing and dynamic process. They never stop collecting so my role continues for years." Kris creates and designs from her heart. She works with a number of hand-selected artisans worldwide to create the perfect accessory or showcase. She's a perfectionist, she's fun, she's genuine and her creativity knows no bounds. Photo of interior and carved display cabinet by Grey Crawford. So Who's Dressing the Rodeo Queens? Whether it's the top spot of Miss Rodeo America or state and regional rodeo queens, one thing is certain, these cowgirls, athletes, and advocates of the Western lifestyle are always dressed to the nines in the most decadent of designs rivaling Paris haute couture, embellished with the rich inspiration of the American West. So where do these fabulous women get their amazing clothes? Not off the rack we can assure you. In the small town of Bastrop, Texas just outside Austin, Julie Ewing, of J Ewing Designs, spends hundreds of hours designing, hand sewing and hand beading blends of sumptuous leathers, exquisite lace, handpicked crystals and stones and the richest of fabrics into one-of-a-kind masterpieces - truly art to wear. Julie's passion for what she does is reflected in each of her creations. Taking her inspiration from Paris haute couture and the romance of vintage designers, Julie has developed a trademark look - pure glamour, elegance and grace. Throughout her more than twenty years in Western design, Julie has seen five Miss Rodeo America's crowned in her creations as well as numerous state and local title winners. But a close look at what she does and what she creates could undeniably be donned at the Oscar's or out for an evening in Monte Carlo. She creates the unexpected while maintaining an air of classic elegance and rare beauty. As we watch Western-inspired designs finally begin to make their debut into mainstream America, we, who have always embraced the romance and beauty of the Western culture, wait in anticipation for the day when these designs finally hit the runways of New York. That's not far off. In an exciting conversation with Julie, she revealed that she and her designs had been requested to exhibit at a show in New York this fall. Daunted by this offer yet ecstatic, the idea of this small town, multi-talented, charming Texas gal to actually have the chance for the world-class market to embrace her designs...very exciting indeed. Being an independent designer, her resources to accomplish this are limited, yet opportunities like this happen perhaps once in a lifetime. On behalf of Julie and the unveiling of great designs of Western America, anyone with the philanthropic spirit to encourage Julie and her debut in New York should email: info@designamerica-nyc.com. How exciting if any High Noon Smoke Signalers can help get J Ewing Designs to the Big Apple! If Coco Chanel had designed chaps, it's likely they may have resembled the ones created by Denice Langley, as this month's "inner Cowgirl" is about taking the Western style to high design. Growing up in Cortez, Colorado, passionate about horses and being crowned Rodeo Queen in high school, Denice was always a step apart from the traditional look of her rodeo-ing counterparts. Even as a young girl, her eye went to the styles of Ralph Lauren, Coco Chanel and Hermes - sophisticated, rich and perhaps a bit whimsical. Denise remembers when she was in high school, she just hated the cowgirl shirts and outfits that were available to buy at the local tack stores. She wanted to look different. 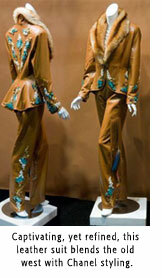 She would buy $50/yard gabardine fabric, design and sew her own shirts to wear at competition. Soon, she wasn't just making them for herself but many of the men wanted them too. At a very young age, Denice Langley, designer, was born. But life got in the way for a period of years and Denice became part of the six figure corporate world working in Oklahoma City as a retail manager for Helzberg Diamonds. Then one day, as she was nearing 40, she woke and realized she wasn't happy. "I would go to work when it was dark and come home when it was dark - seven days a week! This is no way to live!" The opportunity to work with her mother's thriving business in New Mexico gave her the escape route she needed and put her back in the world of horses she dearly missed and loved. Selling her home and living in a horse trailer for a year and a half, Lisa got back into showing cutting horses. 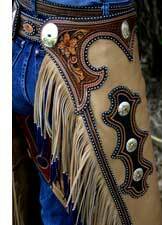 But, in true Langley style, she wanted fancier chaps than the ones that were available. So, instead of saving up to have them custom-made, she saved up and bought her first leather sewing machine and designed her own. Incredible tooling, detailing and fit, they were an immediate hit and she found herself taking orders, designing and making chaps for many men on the circuit. Not happy with the silver available to use as accents, she found her own silver supply and, with the help of a cassette video, became a self-taught engraver. 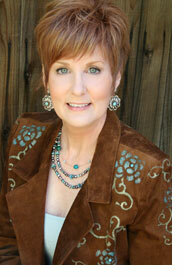 That's Denice, self-taught all the way driven by a passion for transcending Western-style to high-design! Artist extraordinaire by nature, today her lines include purses to rival any Hermes bag; belts and accessories to adorn that little black dress, custom sandals, vests and coats. A stunning suede cape adorned with fur and sterling took the 2009 Western Design Conference Fashion Show by storm drawing oohs and ahhs from the savvy Jackson Hole crowd. But wait -there's more! Denice creates the most fabulous line of boot accessories which she calls "UFF's." These boot adornments take any pair of cowboy boots or UGG's and transforms them to the mood your in that day. Want a little fringe, perhaps you're feeling a bit in the mood for mink? These interchangeable zip-on boot cuffs take the average and transform them into the exceptional. Today, Denice is back in her hometown of Cortez, Colorado where she still works seven days a week but now it's in her studio with her horse right outside and her dogs at her feet. Everything Denice creates is original and completely hand-made. You'll find no rhinestones on anything she makes but what you will find is what she does create will turn heads on 5th Avenue in New York. It may be western-inspired but it's all high-style. 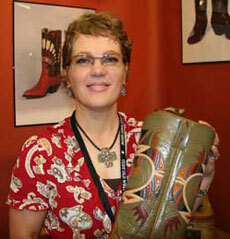 This month, Smoke Signals chats with Lisa Sorrell, founder, owner and artisan of Sorrell Custom Boots. In a most engaging conversation with Lisa Sorrell, it became immediately evident that this woman is truly an artist passionate about her work - creating some of the most beautiful boots anyone's feet could ever don. "I'm a boot maker, not a cowboy" is her opening statement. And how she stumbled into her craft is story of the most unlikely of circumstances. Lisa was raised in a strict religious community in Missouri akin perhaps the Amish. At an early age, Lisa began sewing her own clothes as what she was allowed to wear couldn't be "bought at Macy's." By the age of 15, she was an accomplished seamstress sewing clothes for women in the community. At the age of 20, she married and together she and her new husband moved to Oklahoma. Needing a job and knowing her talent for sewing, she answered an ad in the local paper for a position stitching boot tops. She had absolutely no idea what this was - had never heard of it before. But, her sewing skills landed her the job and she spent the next 1-1/2 years working with master boot maker and designer Jay Griffith. And the rest as they say, is history. By 1996, she opened her own business which, as she tells it, could never have been done without the dedication and support of her husband Dale. Now, both wife and mother, her husband provided her the team support to develop her artistic design skills and begin marketing her rich creations. She began by making real working cowboy boots but her real love was creating what she calls "office boots" - the kind of boots men wear with the finest suits in professional environments. It was these "office boots" that brought her artistic talent to the forefront. 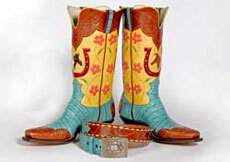 In the most charming of statements, Lisa believes "cowboy boots are a way for men to wear high heels in bright colors." Well done Lisa for in just 3 short years, her work was recognized and featured in Tyler Beard's hard-cover coffee table book, "The Art of the Boot" published by Gibbs Smith in 1999. Today, Lisa's clients span the globe from Belgium to Buenos Aires. While the majority of her clients are men, the number of women she designs for is on the rise. She meets personally with each of her clients for custom fittings but more importantly so she can glean the personality of the person destined to wear them. Through that, she can create the design and incorporate the colors that will reflect the heart and "sole" of the wearer. "They aren't just a piece of footwear, they tell a story." As a boot maker and an artist Lisa feels that "cowboy boots are the perfect representation of art and craft meeting." Today in her studio, she employs an apprentice but don't expect overnight results. The intense design work and craftsmanship that goes into each pair takes time. You can be sure, though, that they will be worth the wait! "It's so fun to be unique within the good old boys network," was Lisa's opening comment in our interview. Unique perhaps because she's a woman, but more likely unique because her passion, her artistry and integrity all go into each piece she creates - heirloom pieces that are built to ride. "I feel so lucky that at a young age, just in my twenties, I discovered what it was I wanted to do - build the finest saddles. I was always artsy and as an art student at UCLA I began dabbling in leather as a medium and found I loved it. I began selling my pieces at street fairs (purses, belts, etc) which paid for my last two years of college." Following graduation, Lisa moved to Northern California where she opened Sundance Leather Company and in short order, had 33 employees and a full manufacturing operation producing her purse and belt designs. One day she realized she had become a manager of a good-sized business and was no longer practicing the art she loved. She wanted to be an artist again. She spent the next two years apprenticing with a very traditional artisan saddlemaker. As she recalls, "When I finished the first saddle I ever made I knew this is what I wanted to do." And done it she has. As you're sitting at your computer reading this article, take a minute, open another window in your browser and go to www.skyhorse.com and just be blown away by the works of Lisa Skyhorse. Sometimes it's true, a picture is worth a thousand words... Sigh... it's one beautiful work after another. Okay, back to the story. 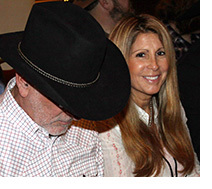 Along her way in life, in 1972, Lisa met husband Loren Skyhorse. A perfect match as Loren was the consummate horseman and quickly became as passionate about saddlemaking as she is. Coming from a long line of leather toolers, Loren works alongside Lisa today using tools that belonged to his grandfather. 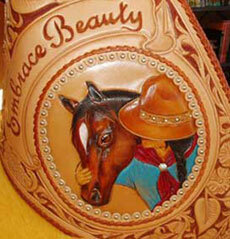 Together as a team they create works of art in saddlery.